This hotel is located in the Black Forest, 5 km south of the world-famous spa and casino town of Baden-Baden. It offers large rooms with a balcony. All rooms at Schwarzwaldhotel Sonne include a TV and private bathroom with shower. A buffet breakfast is provided each morning at Schwarzwaldhotel Sonne. Schwarzwaldhotel Sonne is within a 10-minute drive of the Caracalla Therme thermal baths, Baden-Baden Casino and the Festspielhaus concert hall. Schwarzwaldhotel Sonne offers free parking and is 15 minutes from the A5 motorway. Baden-Baden Airport and the Alsace region of France are a 25-minute drive away. When would you like to stay at Schwarzwaldhotel Sonne ? Classic-style room with satellite TV, a balcony and a private bathroom. Each day we'll check prices and send you an email for your selected dates at Schwarzwaldhotel Sonne. If you don't have specific dates but would like to check prices for say next weekend or say next month we can check the price too. 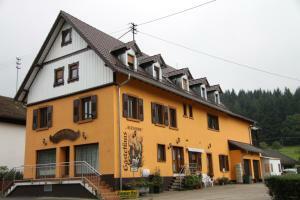 Click to write a review and share your experience of Schwarzwaldhotel Sonne with other travellers.